Confirmation "You've got the keys." Confirmation is a lot like driving. After preparation in the classroom and behind the wheel, the candidate is given a license to drive. The freedom and responsibility of 'having the keys' is a sign of adulthood. Turn the card around to see the Papal Keys with a Catechism selection from CCC 1309. It speaks to the spiritual maturity of the Confirmed person being awakened to the sense of belonging to the Church of Jesus Christ, the universal Church as well as the parish community. Size A7 card (5"x7") Original art by Blake Van Oosbree. Hot Rod Red envelope included. A Rock Climber who has his belay going straight to the clouds being led by the Spirit. The back of the card includes an amazing selection from the Catholic Catechism paragraph 697 about the history of the cloud and light symbolism of the Holy Spirit. Card is size A7 (5"x7") and includes an envelope. Artist Blake Van Oosbree. Come Holy Spirit! 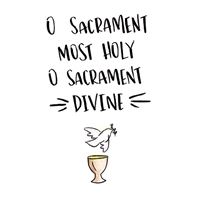 The perfect card for ANY Sacrament from Baptism to Ordination. Keep a box on hand to use for the next occasion. Blank inside note cards come in set of 20 cards. White envelopes included. Cards are size 4.25" x 5.5". Great for Catechists! A drivers license and Confirmation are two definite signs of adulthood. The Holy Spirit is the best co-pilot! "This card is actually cool to receive," said a recent 15 year old Confirmand. Size of card is 4.25 x 5.5 inches. Comes with red envelope. Intended for those receiving the Sacraments of Initiation at the same time. Especially First Communion and Confirmation. Salutation on the inside "May these Sacraments strengthen and nourish you on your journey of faith." The back of the card is a selection from the Catechism on the Sacraments of Initiation.